It’s a sticky-hot morning on the Eastside, and I’m sitting at a bus stop next to the 10 freeway, ready to travel to Santa Monica using more modes of transportation than any sane person should. Call it stunt journalism, but even for a (mostly) car-free Angeleno like me it’s hard to keep track of the various ways there are to get around nowadays. 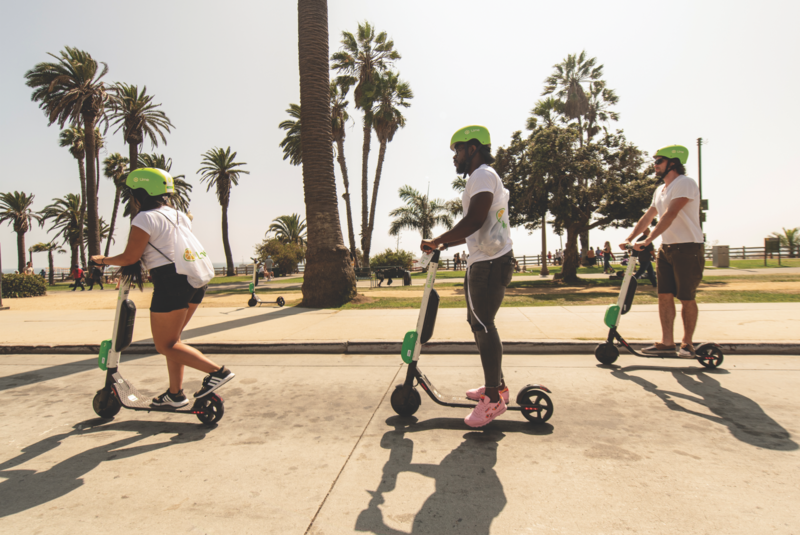 Bike-share, ride-share, new train and bus lines, scooters—they’re all changing how we navigate the Los Angeles landscape. Today I’ll get to see how they all stack up. An overpass is a strange place for a Metro station, to be sure, but the Silver Line, which kicks of my multimodal odyssey, isn’t your typical city bus route. Running in its own lane, the bus travels 38 miles from El Monte to San Pedro, zipping past traffic jams that other drivers can’t. The only other route like it is the Valley’s Orange Line, but with a $120 billion upgrade of the city’s transit network in progress, these rapid busways will be a more common sight in coming years. When the bus arrives, I settle in between sleepy commuters and a bickering couple, and 30 minutes later I’m in the heart of downtown. I hop off (making sure to thank my driver! ), and head west of the 110 to the BlueLA station on Bixel, where I find a neat little row of white vehicles. 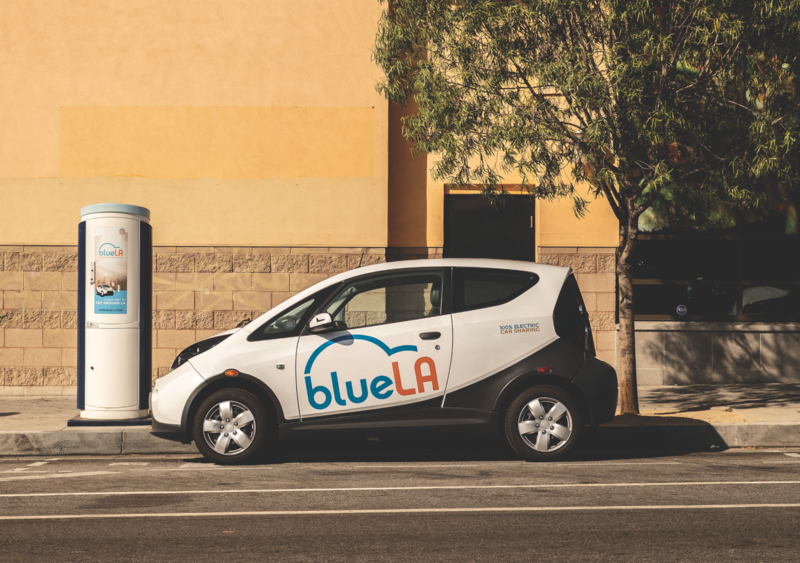 Part of the city’s first electric car-share program (a partnership with the French company Blue Solutions), the Bollaré Group-designed cars are kind of like publicly owned Zipcars—members can rent them from kiosks sprinkled around central L.A. Some 200 BlueLA chargers will be installed by year’s end. So far there are only about 50 cars in service, but judging by how many are reserved in advance, they’re popular. When I climb in the one I booked, I find a pleasantly simple, clean interior (aside from a few crumbs). I’m also faced with the reality that there are too few BlueLA stations on my route for the car to be of much use. The station map says there’s a parking spot open near Mac Arthur Park, so I detour to Mama’s International Tamales (my favorite). After a few minutes of gliding along—the electric vehicle’s quick acceleration takes some getting used to—I’m at the station and plugging the car in for the next driver. Then, with a belly full of jackfruit tamales, I weave through pupusa carts and vendor umbrellas before descending into the Red Line station. 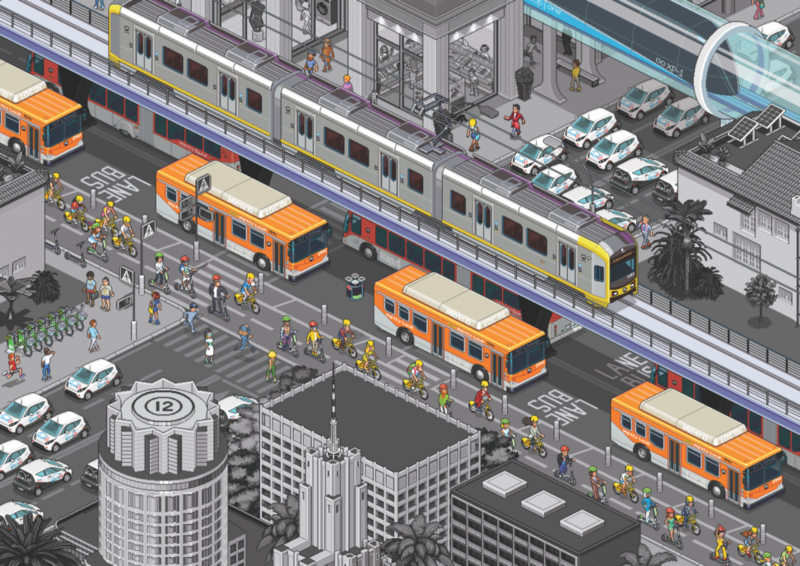 Combined with the Purple Line, which mostly shares the same tracks, the Red Line is L.A.’s busiest (and fastest) train. Today the subway’s not too crowded, leaving me with a slew of notoriously cringey fabric seats to choose from (thankfully, Metro is phasing these out). Heading back downtown—nobody promised this would be an efficient commute— I transfer to the newer, shinier Expo Line at 7th Street/Metro Center. Since it was extended to Santa Monica in 2016, the aboveground Expo Line has seen significant ridership gains—even at 1 p.m. on a weekday it’s full of beachgoers—but because it has to stop at traffic lights, it’s sluggish. 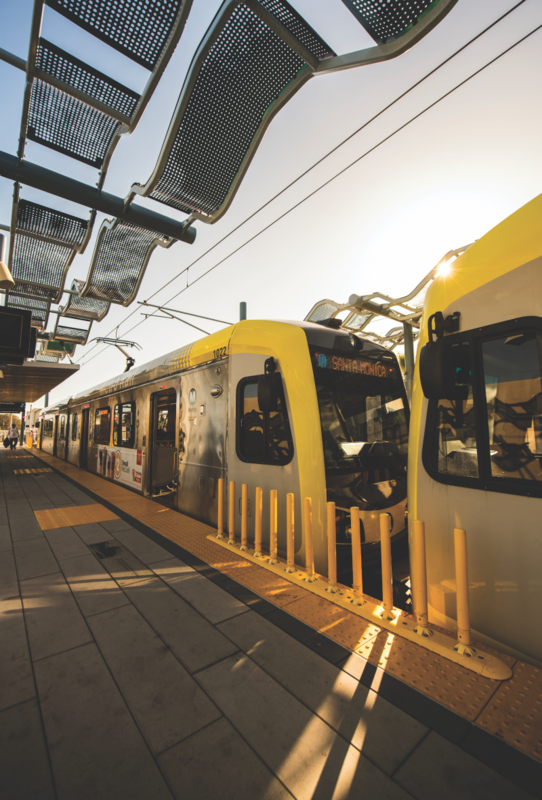 About 64,000 passengers board the popular Expo Line each day. The ride west takes 45 minutes, probably slower than if I drove, but it’s a lot less stressful. I step off the train and into the rare protected two-lane bike path that runs a few blocks down Colorado. Bird and Lime scooters account for a lot of the traffic (this was just days before Santa Monica temporarily banned and then unbanned the two companies in a never-ending saga of scooter drama), but with so many Metro bikes at the station, I opt for pedal power first. Not wanting to stray too far from the bike dock, I enjoy a few blocks of safeguarded bliss before looping back to return it. There are no spaces left, though, and I discover with some chagrin that the next-closest hub is about a mile in the opposite direction. At 5th Street the bike lane abruptly ends, and I have to either share the road with angry drivers or ride illegally on the sidewalk. Sweaty and irritated by my detour, I decide to backtrack to a deli I had passed to grab a drink. I scan the QR code of the first Lime I see and hit the pavement. The scooter is a blast to ride but also a little wobbly, and I shy away from hitting the maximum 15-mph speed as I navigate around pedestrians on the sidewalk. After I rehydrate I spot a Bird nearby—and swap my Lime for it (all in the name of journalism). Its larger wheels seem to make the ride smoother, but that might also be because I’m now in a bike lane. Laws regulating scooter usage are still in flux. Finally I’ve reached the end of my journey. Not quite ready to get back on the train, I wander into the mesmerizing mayhem of the 3rd Street Promenade. After six hours on wheels, it feels good to be back on my own two feet again. Scooters and bikes are handy in a pinch, but to my mind you still can’t beat a good walk. Price: A standard membership is $5 a month plus 20 cents per minute, which is comparable to similar services like Zipcar and Maven. Pros: Compact, good for the environment, and easy to rent, the vehicles are available 24/7 and can take you up to 125 miles on a full charge. Cons: The BlueLA charging network is still in the works. So far most stations are concentrated in central L.A., making the cars useful mainly for in-city errands. Renting one for, say, a beach day would get pricey. Price: Bird and Lime cost $1 per trip plus 15 cents per minute. Pros: The peppy electric machines reach about 15 mph at top speed, making them a cheap, fun alternative for trips that are too short to drive but too long to walk. And they cut down on traffic. Cons: Keeping up with where you’re allowed to ride them is tricky. New regulations let L.A. city council members restrict usage in certain areas, and other cities—like Beverly Hills—have issued bans. Critics bemoan the sidewalk clutter scooters create and say reckless riders can cause accidents. Price: Every share is different, but they range from about $1 to $7 per hour. Pros: Bike rentals are useful if you don’t want to lug around a 20-pound contraption all day, and they can help solve the “first mile, last-mile” gap in some journeys. Plus taking to two wheels is good for your health, reduces traffic congestion, and is a great way to scope out the city. Cons: Many shares require you to return bikes to a specific dock, which isn’t always convenient. And, needless to say, beat-up sidewalks, potholed streets, and inadequate bike lanes in many areas can make pedaling through Los Angeles a dangerous game. Price: $1.75 per trip, paid via TAP card. Pros: They’re typically faster and more punctual than buses and have a higher passenger capacity. Plus they come fairly frequently (every 6 to 18 minutes) during the day. Cons: Trains are more difficult and expensive to build, so L.A.’s network is relatively limited, and nearly all the lines we do have are of the slower, light-rail variety. After-hours service can also be a pain—frequency slows to every 20 minutes after 8 p.m., and trains stop running at midnight (or 2 a.m. on Fridays and Saturdays). Price: Fares range between 25 cents and $2.50, depending on the line. Pros: Commuting by bus (or train) has been proven to reduce anxiety—reading or listening to music beats stressing over L.A. traffic. Plus, buses are the easiest-to-access transit option in L.A.; Metro’s network alone covers 1,433 square miles. Cons: Unfortunately most buses aren’t immune to that traffic, which means service can be slow and unreliable. Fears about personal safety and increased immigration-law enforcement have also contributed to plummeting ridership. A Lot of People Are Getting Hurt on Scooters—so Who’s to Blame?